In an industrial park in San Jose, California, Grant Bonin is holding what looks like the end of a metal water bottle. It is the casing, he jokes, of his company’s “flying steam kettle”: a propulsion system for small spacecraft that uses super-hot water vapour, heated to 1,000C (1,832F), to produce thrust. The company has sold about 40 to date. “It comes right out of the hole,” explains Bonin, who is the chief technology officer of Deep Space Industries (DSI). It is literally rocket science, but the ultimate aim of Bonin’s startup is even more audacious: mining asteroids. No private company has even got close to one. One of the main reasons asteroids will be mined in the future, so the thinking goes, is for the water locked in their clay deposits – and one of the chief uses of that water is likely to be as propellant for spacecraft. Probes and other spacecraft will be able to refuel in space either directly with water, or the hydrogen and oxygen that can be created from it, enabling them to zip around merrily anywhere they want with no end to their useful life. But before the idea of a solar system dotted with gas stations is realised, what is needed are more spacecraft that can actually run on water, which is where selling flying steam kettles comes in. The idea of mining asteroids is more popular than you might think. 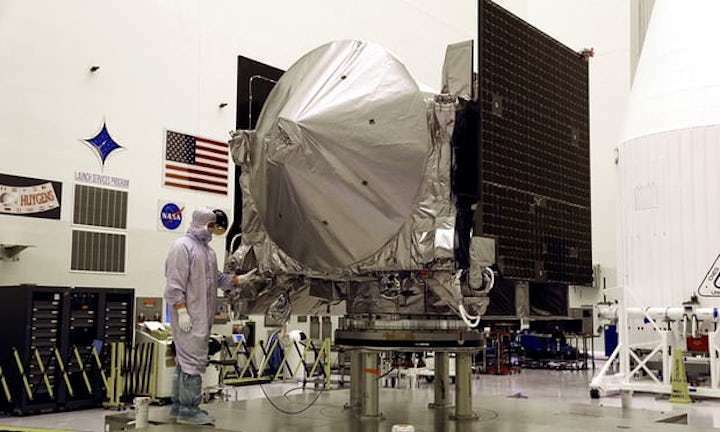 The oldest and biggest of the companies on the scene is Seattle-based Planetary Resources, established in 2009 by investors including Google cofounder Larry Page and Richard Branson. DSI was formed in 2013. Other smaller companies include Aten Engineering and the TransAstra Corporation, both also based in the US. In Britain, pursuing the idea is the Asteroid Mining Corporation (AMC). Established in 2016, it’s run by 23-year-old Mitch Hunter-Scullion, who set up the company after his Liverpool Hope University dissertation on the topic. As these companies see things, the inevitable next step for our civilisation is to expand into space. The Earth is too small for our increasing population, struggling over finite resources. To survive long term, they argue, we need to become a multi-planet, space-faring species. Human settlement won’t happen without the use of what is already out there, as transporting everything from Earth would be too expensive. Asteroids, says Bonin – with their negligible gravity making it easy to lift things off – are the “low-hanging fruit” of space resources. Unlike the Earth or moon, they’re too small to have any appreciable gravity, so it should be easy to lift material off them. Pickings are potentially getting richer as more asteroids are discovered close to Earth: about 18,000 and counting. Some of them, much closer than the ones in the asteroid belt between Mars and Jupiter, also pose a potential hazard to our planet. “The joke is that we’re threatened by giant piles of money,” says Bonin. The revolution in small low-cost satellites is opening up opportunities for these startups to prospect and survey them. Some countries are offering regulatory and financial incentives to encourage the nascent industry. In July 2017, Luxembourg introduced legislation to allow companies with a physical presence in the country to keep any resources they mine from celestial bodies. Similar legislation was introduced in the US in 2015. Luxembourg also offers research and development assistance to space resource companies and invests directly in them through a fund of around €200m established for the purpose. DSI and Planetary Resources have both benefited. Development also takes people: master’s and doctoral degrees in space resources will begin this autumn at the Colorado School of Mines, which is starting the world’s first graduate programme in the subject. And while none of the companies have got near to an asteroid yet, Nasa and other space agencies have missions on the way that will demonstrate capabilities essential for asteroid mining. “Osiris-Rex is a proof of concept for any asteroid-mining activity,” says mission leader Dante Lauretta, a planetary scientist based at the University of Arizona. Chris Lewicki, CEO of Planetary Resources, draws a parallel with the way the US Geological Survey mapped the geology of America, helping early mining companies. “It is both public and private activities that move this forward,” he says. To mine asteroids, DSI’s long-term vision is a swarm of small low-cost spacecraft that would go out to many near-Earth asteroids at once, harvest small amounts of raw material and aggregate them at a central depot that would be constructed at a gravitationally useful spot somewhere between the Earth and the moon. “It is like honey bees going out to a lot of different flowers and flying that back to the hive,” says Bonin. The model circumvents the problem that the asteroids, with their heliocentric orbits, only fly past the Earth periodically and are therefore only accessible to mine for relatively short periods of time. Planetary Resources is betting water will be the first market. One argument goes that there are already gas station customers in the solar system: rocket components that use liquid hydrogen and oxygen floating as space junk. If you could refuel them, you could do anything from servicing satellites to going to the surface of the moon, and that would be worth a lot of money, notes Lauretta, who is also on Planetary Resource’s science advisory board. 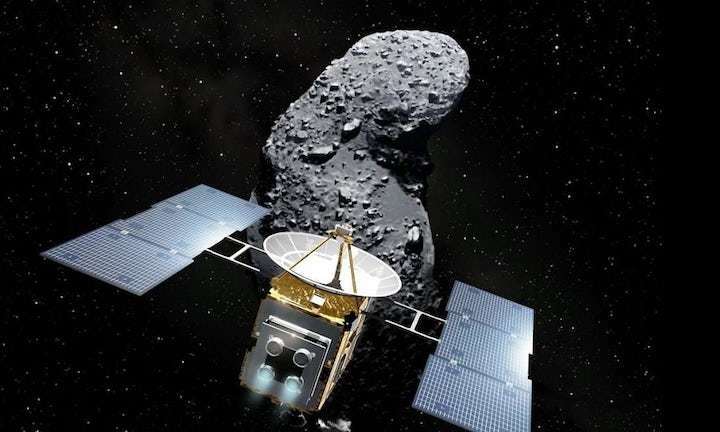 The UK’s AMC, meanwhile, imagines first mining platinum and similar metals – relatively abundant in asteroids – and sending them back to Earth. Going by the current value of platinum, trillions of dollars’ worth is out there. But, notes Lauretta, with a large supply prices would fall. “You would probably just crash the market and we would all have tons of platinum jewellery,” he says. Hunter-Scullion acknowledges the price would depreciate, but thinks it is possible to make a tidy profit first. Water, he says, would come next. Of course, significant technical challenges abound, and they will probably cost billions to solve. To go from recovering grams to kilograms, or tonnes, is a big technological jump and large infrastructure for refining and processing the asteroid ore will need to be developed. Even things like anchoring and holding on to an asteroid can be tricky. Their surfaces are lumpy and non-spherical and each has its own size, topography and rotation speed. Hayabusa only bought back any material because the spacecraft basically tumbled across the asteroid and some dust got into the equipment. “It is going to be a learning curve and at the moment we are at the bottom of it,” says Ian Crawford, a planetary science professor at the University of Birkbeck. Hunter-Scullion, meanwhile, would like to see the British government introduce its own space-mining law, like the US and Luxembourg have done, giving private companies greater rights over asteroids. But while it may be technically possible to mine asteroids a generation from now, the question is should we? One set of issues is around justice, according to Tony Milligan and Robert Sparrow, who study space ethics at King’s College London and Monash University, Australia, respectively. If asteroids belong to anyone, it is to everyone, says Sparrow. Should private companies be permitted to profit from resources that are part of our extraterrestrial commons? While the companies can be taxed, it is hard to see it being equitably distributed across humanity, says Milligan. There are also issues around safety and liability. What if mining an asteroid somehow changes its trajectory, putting it on a collision course with Earth? When it comes to the environment, mining lifeless asteroids is not expected to disrupt any ecosystems but there are still some that may be worth protecting, just like the Grand Canyon or Uluru. Ceres and Vesta, the largest asteroids in the asteroid belt, could be considered unique and distinctive, says Milligan. And do we want to live in the middle of a “giant celestial quarry”, or feel a sense that we “belong” to a place? He draws an analogy to the development of the American frontier. It was so quick and got so out of control that a lot was destroyed in the process. “It became very difficult to get people to think in the long term when there were such short-term advantages to be had,” he says. “We have done so badly at looking after our home that the desire to mine asteroids can’t help but appear profoundly arrogant,” says Sparrow. However, Bonin flips that argument on its head. “I actually think of it as an ultimate act of environmental stewardship for Earth,” he says. People need resources, he argues, and mining asteroids could ensure they were obtained without hurting the planet. Yet before any mining, comes prospecting. AMC would like to put a satellite into orbit around Earth in 2020 to spectrally analyse the near-Earth asteroids to learn what they are made of. Most have never been analyzed this way. It is planning to launch a crowdfunding campaign later this month to start raising the £2.3m it anticipates will be needed for the project. Specialised technology to detect clay minerals has been developed by Planetary Resources. It is currently using the Earth for practice (it launched a satellite into orbit in January 2018), but also has aspirations to undertake a $100m mission to the near-Earth asteroids. However, it doesn’t yet have the funds and recently had to scale back after it failed to raise investment. DSI also has ambitions to get to the near-Earth asteroids. In 2020 it intends to demonstrate a small low-cost spacecraft it calls the Xplorer (its fuel will also, in the main, be derived from water). 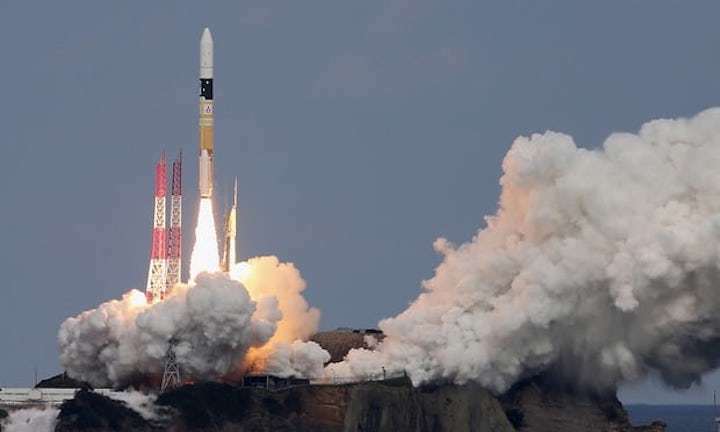 It plans to sell the spacecraft commercially for travel into deep space. Just demonstrating the technology will be enough, believes Bonin, but instruments on board will also hopefully reveal information about asteroids’ composition, “dig-ability” and how they interact with the probes. Asteroid-mining is risky, long term and definitely “out there”. “But our pursuit of it is very pragmatic,” he says.